Dear neighbors, I hope life is treating you well, wherever you may be. I personally can’t complain. Besides, my dad’s garden is laden with tomatoes these days, and as the temperatures have come down to a very comfortable 20°C, I can bake again ! Yesterday I made some gluten-free English muffins (rice flour, sorghum flour, a tad of coconut flour and tapioca starch, updated recipe here) and a few days back I fed our family some stuffed tomatoes. What I mean by « family » is the two of us, plus our visiting children from Brittany, cat not included… she helps themselves to imprudent lizards lying on « her » balcony, quite a treat for a cat normally fed dry food ! I have two versions for my stuffed tomatoes, a meat one and a vegan one ; the photos in this post are about the vegetarian version. Both are without sulfites although some people might object that pork meat should be avoided when dealing with sulfite intolerance. Happily for my very carnivorous husband, it has never been a problem for him. One last word : in France, stuffed tomatoes are traditionally served with rice, but I usually serve them with millet, just as a way of keeping our diet varied. I started doing this way, way back, long before I even realized I had problems with gluten ! – For a sulfite-free version of this pork meat stuffing, you need to ask your butcher to freshly grind 400 g ( a little over 14 oz) of pork meat, or sausage meat, for you. Tell him you want no salt and no seasoning at all. I have found out here in France that most butchers’ seasoning mixes come from packages with almost invariably include dextrose, and this means sulfites. If your butcher cares to keep his customers happy, he will comply. If not, find another butcher!!! – 6 tomatoes, preferably organic… and local ! – a small can of garbanzo beans (265 g or 9.3 oz) net weight, ingredient list : garbanzo beans, water, salt). I realize that you may not find the same exact can size; simply freeze any leftover chick peas for future use in a salad. I do it all the time. – 10 g / 1.35 oz fresh basil while still in season, but you may also use frozen basil leaves. If you prefer dried basil leaves keep in mind to use less. – ½ tsp all natural sea salt, to be adjusted depending on the tomato paste and the beans you are using. Preheat your oven to 200°C / 390°F, no fan. 1. Mix together meat, salt and herbs. Set aside. 2. Cut the tops off the tomatoes and scoop out the flesh. You can save some of the tomato bits and juices to cook with millet, if desired. 3. Fill each tomato with some of the stuffing, place in a baking pan and bake for about an hour and a half. I like my tomatoes to be soft and the meat inside well cooked. You may have to cover them during the last half hour, so keep an eye on them ! The millet should be cooked during this time. 1. Cook the rinsed and drained quinoa in boiling salted water for about 10 minutes. Remove from heat and cover with a lid. It is time to preheat your oven to 200°C / 390°F, no fan. 3. Drain garbanzo beans. Scoop out 200g / 7 oz and mix, with the help of an immersion blender, with 2 TBSP olive oil, 2 TBSP tomato paste, and the basil. Salt to taste. 4. Add cooked quinoa, 65 g / 2.25 oz whole garbanzo beans and combine (do not blend). 5. Fill tomatoes with this stuffing, place in a baking pan and bake for about an hour and a half, or until tomatoes are soft. Keep an eye on them: you may have to cover the dish during the last half hour to prevent burning. The millet should be cooked during this time. 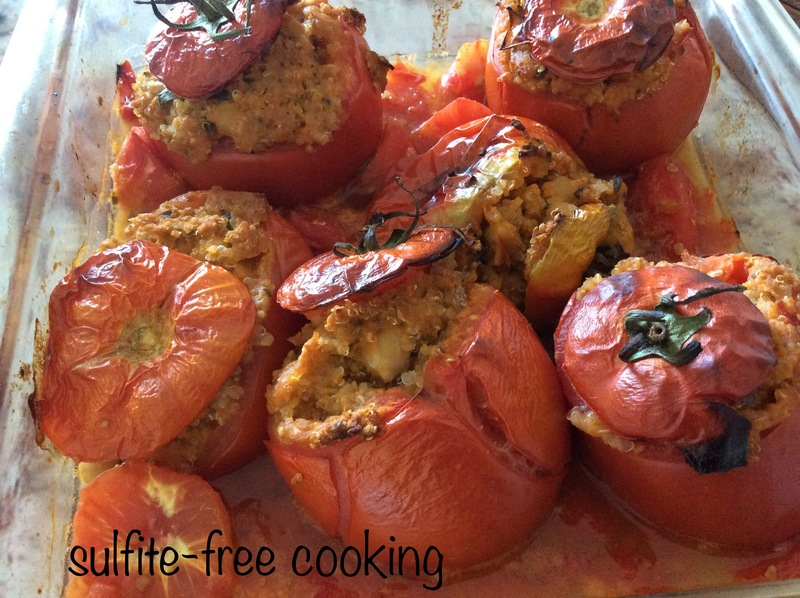 Needless to say, other summer vegetables, red bell peppers for instance, can be stuffed and baked using this recipe. Enjoy !